Earlier this summer, I was contacted by Benét Wilson - the Online Managing Editor for Business Aviation (and on Twitter as @AvWeekBenet). Last year Benét interviewed me about check-point friendly laptop bags for her column "Towers and Tarmac". This year, Benét moderated a panel on "Becoming a Multimedia Journalist" at the annual conference of The National Association of Black Journalists. She asked me if I would send her some thoughts on what laptop bags would be good for journalists. The following piece is what I came up with. Journalists are a varied species – and the tools of the trade they carry are just as varied. So when Benét asked me to put together some recommendations for bags for journalists, I got a little concerned. But after some field research, I’ve been able to identify four sub-species of journalists and the bags that would be appropriate for each. Some JM’s are a little clumsy and need to protect their most sacred of tools – the laptop. But they also want plenty of room for their other gear plus easy access to recorders, notebooks, granola bars, etc. For the JM whose laptop is primary and perhaps prone to bashing themselves and their bags around, I recommend the Smart Alec backpack and Brain Cell from Tom Bihn. I have fallen over backwards while wearing my Tom Bihn with Brain Cell, landed square on my Macbook Pro, and it emerged totally unscathed. Say you’re the type of Journalist Maximus for whom the camera is the thing. And your backup camera. And your backup backup camera. Plus tripod. And some other gear that you like to have with you “just in case”. And that laptop you have to carry so you can file the story. Well, the Aura Backpack from Slappa is a good choice. Slappa has a long history of making awesome bags for the toughest of gearheads – DJ’s. They’ve now translated that expertise into bags that are perfect for camera-ladden journos on the go. They’ve included lots of padded pockets for cameras and lenses as well as straps for tying on tripods and other misc gear. Plus you can slide a laptop in. Finally, there are some Journalist Maximus (Maximi?!) who are, well, a little girly – and don’t want to carry around a big, bad backpack. These ladies are possibly a little in denial about how much they carry. Luckily, they have a hero in Melissa Beth Designs. Melissa Beth has created a startlingly roomy backpack, called the Piggy Back, for a laptop and other gear that has a very slim silhouette and sits well on a smaller frame that often comes with this variation of the JM sub-species. OK, so these are not made for carrying laptops (though you could probably slip a nice laptop sleeve inside), but I could simply not resist the adorable animals that adorn these Little Kid Packs designed by Dante Beatrix. This one sports Fei-Fei the Panda, but there are several others to suit your child's personality: Nigel the Shark and Senor Gomez the Penguin are my other two favs. You can get these Little Kid Packs from Raspberry Kids, an online retailer for fresh kids' products. And I found out about Raspberry Kids via Yoyomama - a great newsletter written for moms on the go in the Lower Mainland. Look, I'm not going to lie to you. I wanted to open this review with the statement, "The pink polka-dot Express Laptop Backpack from Mobile Edge is the bag that Strawberry Shortcake would carry if she were a grown-up freelance blogger/web designer." But I was worried that some of you might take that the wrong way. I had a bit of a *thing* for Miss Shortcake when I was younger so, to me, that is a totally positive statement. See the Express is pink, but not ALL pink. And it has pink racing stripe piping down the side. Shows that you're ready for action. It's a little sporty, a little designer-y. But not so uber-sophisticated that your friends Angel Cake and Ginger Snap will accuse you of going all corporate, "You used to be one of US, Straw! What HAPPENED?!" 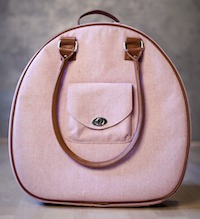 The pink polka-dot Express Laptop Backpack from Mobile Edge is a fun and functional bag to comfortably carry your laptop and other gear. The pink and chocolate colour scheme is vivid, but not overwhelming. And its silhouette is curved and feminine. But don't think that means this bag isn't all business on the inside! If you like backpack style laptop bags, make sure you check out the full review of the Express! The Smart Alec is super comfortable - the straps are wide and well padded. For you folks who are super-ergonomic there are sternum AND waist straps for additional support and security. I like to play it loose, though, so I removed the waist strap (it has a cool design so that when it was removed, there was no extra hardware left; and it lies quietly waiting for me to hike Everest ... shh, don't wake it). Now, it did take me a while to get used to the Smart Alec. The placement of the opening is different than most backpacks I'm used to. I'm used to a straight top-down opening. But the Smart Alex kind of opens like a can - where you access the interior with the back of the bag facing towards you. I like this very much now because it doesn't expose the contents of your bag as much to prying eyes (don't want anyone to start coveting my chocolate chip cookies and Vanity Fair that I take on the plane with me). Read the full review of the Smart Alec from Tom Bihn! 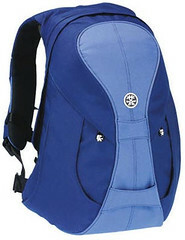 Did I mention that I started reviewing more laptop backpacks? Well, I'm mentioning it now :) More and more I've heard from commuters and students, particularly women, who want something that won't cause back problems and doesn't make them look like they just stepped off the trail. The King Single was definitely up for my urban Eco-Challenge. The backpack is tough, durable, water-resistant and weather proof - the black zips are heavy-duty and have weather covers to protect the bag's contents from the elements. It's great from a security point of view too - with its sleek design and covered zips, no one is sneaking into the King Single. It's also a very well balanced bag - when I had to stand on the train, the King Single sat on upright on the floor, solid as can be, leaving me free to sip my coffee and judge my fellow passengers' inferior backpacks. 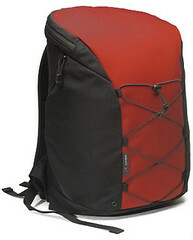 Read the full review of the King Single Laptop Backpack from Crumpler.